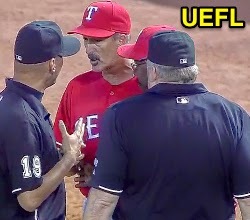 1B Umpire Vic Carapazza ejected Rangers Pitching Coach Mike Maddux in the top and Instant Replay Review confirmed Carapazza's out call in the bottom of the 8th inning of the Red Sox-Rangers game. In the top of the 8th, with one out and none on, Red Sox batter Will Middlebrooks attempted to check his swing on a 2-2 sinker from Rangers pitcher Justin Germano, which hit his arm. Replays indicate Middlebrooks did not attempt to strike the pitch, the call was correct. At the time of the ejection, the Red Sox were leading, 6-3. In the bottom half, with none out and one on, Rangers batter Adrian Beltre hit a 0-0 fastball from Red Sox pitcher Junichi Tazawa back to Tazawa, who threw to second baseman Dustin Pedroia to first baseman Mike Napoli as Beltre arrived at first base, Rangers baserunner R1 Elvis Andrus out at second base. Upon Replay Review as the result of a challenge by Rangers Manager Ron Washington, Carapazza's ruling was affirmed, the call was correct. At the time of the review, the Red Sox were leading, 8-3. The Red Sox ultimately won the contest, 8-3. This is Vic Carapazza (19)'s first ejection of the 2014 MLB Regular Season. This is Vic Carapazza (19)'s fifth Replay Review of the 2014 MLB Regular Season. Vic Carapazza now has 9 points in the UEFL Standings (5 Previous + 2 MLB + 2 Correct Call = 9). Crew Chief Bill Miller now has 16 points in the UEFL's Crew Division (15 Previous + 1 Correct = 16). This is Crew Chief Bill Miller's 14th supervised Replay Review of the 2014 season. This is the 38th ejection of the 2014 MLB Regular Season. This is the 258th Instant Replay Review of the 2014 MLB Regular Season. This is Rangers Manager Ron Washington's 10th Replay Review of 2014. This is the Rangers' 3rd ejection of 2014, 1st in the AL West (TEX 3; HOU, SEA 2; LAA, OAK 0). This is Mike Maddux's first career MLB ejection. This is Vic Carapazza's first ejection since Aug 11, 2013 (Asdrubal Cabrera; QOC = Y [Balls/Strikes]). Umpires are now 137/258 (.531 Affirmation Rate) in Replay Reviews during the 2014 MLB season.